This past January while in Paris I tried to contact Michel Fournier, Philippe Garrel’s legendary cameraman on six films, from Marie pour Mémoire (1968) to Athanor (1972). I was getting ready to go to Bordeaux where I was to present two Zanzibar films (Garrel’s La Concentration, 1968, and Patrick Deval’s Acéphale, 1968) in conjunction with the exhibition on French psychedelic art at the CAPC, Bordeaux’s museum of contemporary art. Zouzou and Patrick Deval would be presenting the films with me, and I wanted to ask Michel a few questions beforehand. When finally, after a week of trying to call him, I got a message on France Télécom saying the number no longer existed, I knew something had happened. Michel didn’t travel much. We last spoke in September 2008. I gave Michel a call just to say hello and to find out how he was. I told him about the exhibit in Bordeaux and said I would be in touch. He sounded fine. I had last seen him in October 2001, when he exceptionally made the trip to Paris for a roundtable discussion hosted by the Cinémathèque Française. Re: Voir Editions had just brought out Garrel’s Le Révélateur (1968) on cassette and I was invited to lead a roundtable on the film. Bernadette Lafont and Alain Jouffroy were also with us, and Patrick Deval in the audience. My interlocutors had not seen each other in a very long time and the atmosphere was electric. The unusual nature of this event was later confirmed to me by Bernadette Lafont. The Cinémathèque was supposed to be recording our discussion, but unfortunately there was a technical snafu and nothing made it onto tape. I first met Michel in the summer of 1999, shortly after I began my research on the Zanzibar films. He invited me to come visit him in Semur-en-Auxois in Burgundy. I remember my surprise when, upon picking me up at the train station, all dressed in white, he asked what my astrological sign was and then immediately started to map out my chart! Apparently, after going into early retirement, he became adept at astrology. I spent the afternoon listening to his memories, most of which were so outrageous I doubted I could publish an interview from them. He also gave me a photo of him with Philippe, probably taken on the set of La Cicatrice intérieure (1971). In 1968, the young Michel Fournier had a reputation for being “tranchant” (severe) and the intervening years hadn’t softened him any. That year, he proffered the following memorable definition of a camera: “a machine which moves on a trolley and whose long shots are bursts of fire” (1). His uncompromising nature was confirmed by all those who knew him. He had abandoned the shoot of Acéphale after a dispute. At the end of Anatomie d’un rapport (1976) (2), Fournier took the initiative to zoom in on his characters, while the film’s voiceover indicates the directors’ disaccord. It would be Fournier’s last film as cameraman. Like the other participants in the Zanzibar constellation, Fournier was something of a dandy. It’s visible in these wonderful photos. I can’t help but think of him as a spiritual brother of the character, Adrian (Patrick Bauchau), in La Collectionneuse (1967), who declares he can’t have a conversation with someone he deems physically unattractive (laid). 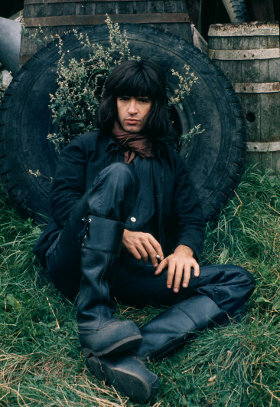 Like Garrel and Nico, he wore his hair long with short bangs, in a medieval-inspired look. Besides shooting several of the Zanzibar films, Fournier also made one himself, L’Homographe, a marker of both Sylvina Boissonnas’ attempt to promote film technicians to the level of creators as well as her esteem for him. In 1969 or 1970, he won a prize at the Festival of Young Cinema at Hyéres, where Garrel had won the first prize for Marie pour mémoire. It’s hard not to think that Fournier’s prize was as much for his work with Garrel as for his own film. Curiously, this magician of light chose to make a camera-less film, working directly on the filmstock. One day, perhaps, the Cinémathèque Française may re-discover it somewhere in its vaults. Like all of the Zanzibar filmmakers, Fournier was in a hurry. He lived his twenties at an accelerated pace, dropping out of the École Louis Lumière without finishing his diploma. 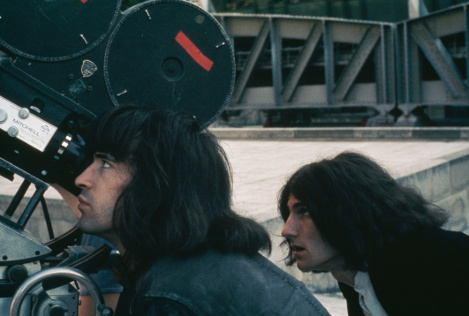 His collaboration with Garrel in fact pre-dates Marie pour mémoire; he had filmed The Pink Floyd for him for French television in 1967. (3) In my book on these films, I mention the Icarus complex that many of the Zanzibar participants seemed to embody and Michel Fournier perhaps best of all: a cameraman at twenty-two and in retirement by thirty-one. (4) Still, Fournier’s work as co-creator of those early Garrel films remains an incontestable achievement. Le Révélateur was his favourite, because the film’s miniscule budget forced him to “create something new in almost every shot” (5). Each of these films is very special, and several of them still await a larger public, in particular La Concentration, Garrel’s very strange film shot on the heels of May 1968. Finally, not knowing whom else to contact, I called Michel’s ex-companion, the Swedish photographer Ewa Rudling. It was thanks to her I first met Michel. She told me what I already suspected: that Michel had died, apparently in his sleep of a heart ailment shortly before Christmas. He was just 63. Acéphale (Patrick Deval, 1968). Fournier did most of the camerawork on this film. Guy Gilles finished shooting it. La Cicatrice intérieure (Philippe Garrel, 1971). Fournier shares the camerawork with Jean Chiabaut, assisted by Jacques Renard. Athanor (Philippe Garrel, 1972). Fournier shares the camerawork credit with André Weinfeld. Fournier quoted in Cahiers du Cinéma, No. 204 (September 1968), p. 49, and cited in my book, The Zanzibar Films and the Dandies of May 1968 (Paris Expérimental, 2007), p. 225. Directed by Luc Moullet and Antonietta Pizzorno. This was a short segment in the 53’ program of “Bouton Rouge”, produced by Harris & Sédouy, that was aired on 21 May 1967. In addition to his work as a cameraman, the IMDB also lists four films that he edited for French television. Fournier, quoted in The Zanzibar Films and the Dandies of May 1968, p. 225.